What if the asteroid that forever changed life on Earth missed the planet completely, and giant dinosaurs never became extinct? That is the question posed in the promotions for The Good Dinosaur, by Disney’s Pixar Animation Studios, which is being released in 3D on November 25. The question is an intriguing idea, but had less to do with the movie than I expected. That said, at a media preview on Monday, my family enjoyed The Good Dinosaur, and it provides a great way for families to discuss fear. In my opinion, forget about the premise, and just sit back and enjoy the show. The opening scene shows a family of dinosaurs (aptosauruses) farming. They grow corn and raise chickens. Apparently this is what would’ve happened if they had not gone extinct. Their silo is being ransacked by a “critter,” who turns out to be an early human. This human walks on all fours and acts a lot like a dog. Aside from allowing dinosaurs and humans to co-exist, and establishing the dinosaurs as having typically human characteristics and the cave boy as having animal characteristics, the idea of the asteroid missing Earth plays a very small role in the movie. Instead, the movie is primarily about young Arlo the dinosaur learning to face his fears. From the very moment he cracked open his egg, he has been a fearful dino, unlike his more adventurous siblings. His father has faith that he will eventually overcome these fears to (literally) make his mark — as the rest of the family has done by putting a muddy footprint onto the silo after a major accomplishment. 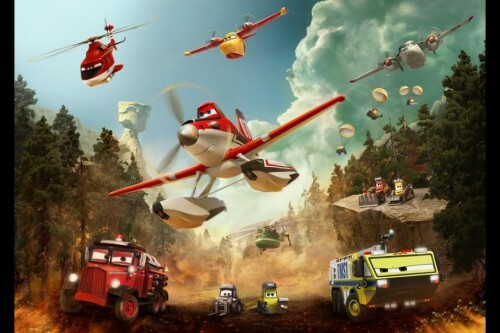 Without spoiling things, Arlo becomes separated from his family and faces many adventures on his way back, accompanied by Spot the human, who is referred to as a “critter.” During the adventures, they meet a T-Rex family and the elder dino (Sam Elliot) gives him the sage advice that the key to conquering fears is to feel the fear and do what you have to anyway. I thoroughly enjoyed the role reversal with Arlo and the other dinosaurs having more human characteristics and the Spot in the role of a devoted animal companion. The 3D effects in this movie are intriguing, because on the one hand the scenery looks amazingly realistic, but the dinosaurs and other critters are very cartoonish. The animators clearly put a lot of skill and effort into the details of pine trees, mountains, and water. It is clear it was a stylistic decision to make the dinosaurs look less realistic, perhaps to be more enticing to younger audiences. My kids enjoyed The Good Dinosaur and I think as long as people don’t get too hung up on the promotional premise, others will too. There are a few dinosaur fight scenes, some scary storm scenes, and yes, death — so you will have to decide if your children will be okay with those scenes. Also worth noting, prior to the movie is a short, “Sanjay’s Super Heroes.” Make sure you are settled into your seats in time to see it. The short depicts a Hindu father practicing his prayers while his young son tries to watch a superhero tv show a few feet away, much to his father’s chagrin. It turns into a delightful tale about priorities and heroes. 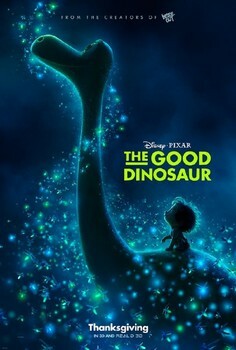 The Good Dinosaur opens just before Thanksgiving and you can find trailers on Facebook at https://www.facebook.com/PixarTheGoodDinosaur and on the web site at http://movies.disney.com/the-good-dinosaur. Disclosure: The movie’s PR team graciously provided my family with three tickets to the media preview event. This did not influence my review of the movie. My kids have expressed an interest in helping in the kitchen practically since they could talk. At times, this was exasperating, but I tried to be patient as there is so much value to letting kids cook. In addition to teaching them a lifetime skill and getting them interested in preparing healthy foods, letting kids cook has been proven to help with math (all those fractions and equations involved when altering recipes), and may even reduce their chances of getting involved with drugs. There are many other benefits as well — improved reading skills, bonding time with family, real-life application of science, and more! So why doesn’t everyone do it? I had all of the same concerns above when my kids started joining me in the kitchen, but I also have a Montessori-influenced approach to parenting. (My children have a very headstrong approach to being kids — they always want to try everything whether I think they are ready to or not!) In addition to encouraging cooking (Montessori school kids often have to prepare and bring in their own lunches at a very tiny age), the Montessori method encourages providing child-sized tools for any job. This is why I was intrigued by the Curious Chef line of kitchen tools. Embracing the many benefits of having kids in the kitchen, they produce cheerful, right-sized tools for kids. They asked me to try out their products and sent me a cupcake set and a 16-piece cupcake and decorating set and a 3-piece nylon knife set. 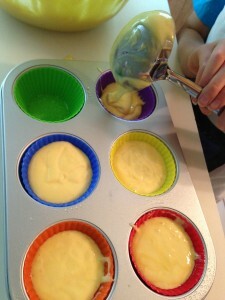 It turns out that the cupcake set was the perfect thing to cheer up JavaGirl (age 9) while her brother was away at camp. 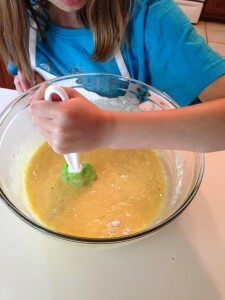 We had a jam-packed schedule, but in between her vacation bible school camp and horseback riding lesson, we quickly cooked up some cupcakes in the six-spaces tin. They have a recipe on the side of the box that is yields six cups, but inexplicably, I had every type of flour EXCEPT self-rising in my pantry that day! So we grabbed a box of cake mix and used that instead. In the interests of time we used pre-made frosting rather than mixing up our own from the directions provided. What I was most interested in seeing was how the silicone cups would work (separate inserts that went into the metal pan, rather than a silicone pan). I have used some silicone tools, but I have never used these before. And because I’m perpetually curious, I decided to use our leftover cake batter to cook cupcakes in another pan of mine, in paper wrappers, to see if it would make a difference (JavaGirl loves the idea of an experiment). 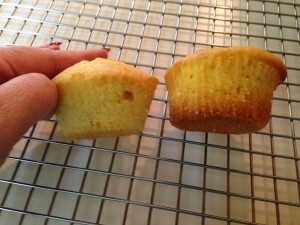 The cupcake on the left was baked in the silicone cup, the one on the right was in a paper wrapper. JavaGirl has decorated cakes using my Wilton bags and tips before, in fact, earning her American Heritage Girls Cake Decorating badge. But the Curious Chef set comes with a plunger-type of decorating system. The tips screw onto the end without requiring additional rings. 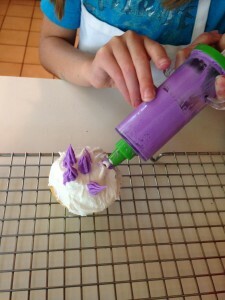 There are five shapes of tips including one that would allow you to inject something into the middle of a cupcake. I really wanted to try that one, but JavaGirl wasn’t interested in that that day and time was tight, so, um, I may be using her tools another day! Though I was able to use the plunger (to demonstrate how to use it), it is nicely sized for children’s hands and in my opinion, is definitely easier for kids to use than a decorating bag. And also, easier to clean. If there were one addition I would recommend to Curious Chef, it would be to include a small tip-cleaning brush and mesh bag (to hold tips while in the dishwasher), fortunately I already had both. The sixteenth piece of the set is a packet of blank recipe cards with stickers. JavaGirl enjoyed working with the decorating set and would’ve happily fiddled with it for quite a while if we had not been in a hurry. Incidentally, the set also include a nylon mixing spoon, which again, is a nice size for kids, and a nylon frosting spreader which worked well for JavaGirl. A final note on the set — at first I was a little surprised that the pan was only for 6 servings, but when I thought more about it, I like this. When we are cooking just for ourselves, 6 is just right and none of those extra cupcakes hanging out for days. Also, JavaGirl and I discussed other ways we could use the pan/silicone cups. 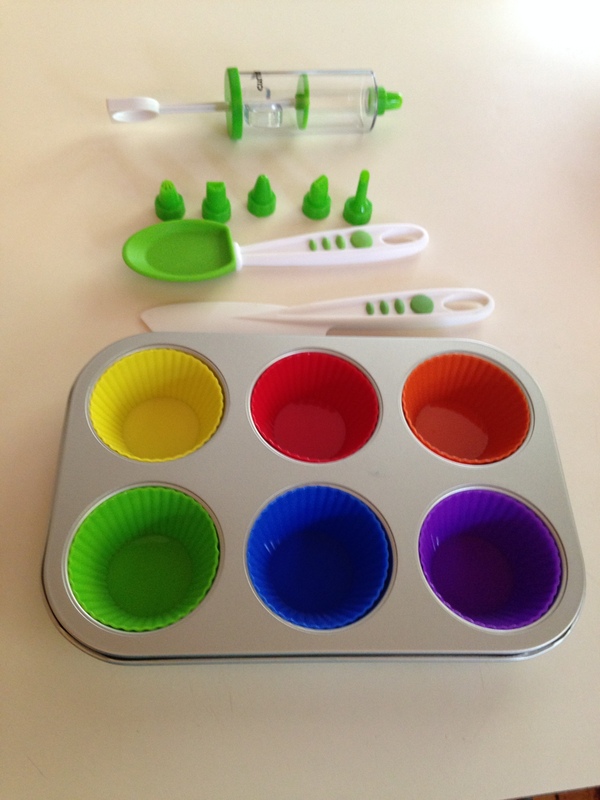 Of course we could make muffins, but in our family, we’ve been enjoying making some of the many “muffin pan recipes” out there including breakfast eggcups (think scrambled eggs with seasonings and cut up veggies). We plan to try those out in this set soon to see how they come out versus just in our regular pan and the small size is convenient. Overall, the set was a huge hit with JavaGirl, despite the fact she already has access to so many tools. She felt pride in this being HER set. And don’t think this is just for girls, JavaBoy tends to cook even more than JavaGirl, so I think he’ll end up using this a lot as well. The nylon knife set, on the other hand, got a mixed reaction from JavaGirl. When she was a preschooler, I started her out with a different kind of safety knife, and she has since progressed to using my Wusthof knives. However, I still worry at times about her injuring herself, so I was very intrigued to see how these would workout. Initially, she rejected them, claiming they required more pressure on her part. I tried one out on a few different things such as tomatoes, celery, and peaches — they could cut them all, but did require a little more pressure on harder materials. (Cut the tomato well, however!) 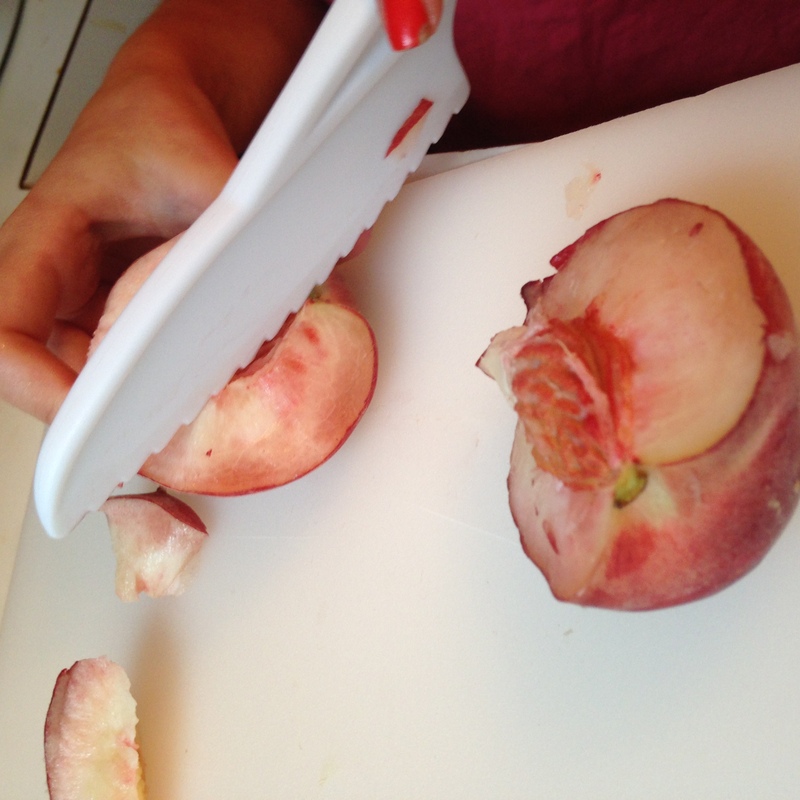 Yet just last night, I caught JavaGirl using one of the nylon knives to slice up a peach. So my thoughts are that if you are holding back on letting your child cook due to fear of injury from knives, this is a great option. If your child already safely uses knives, you may or may not be interested in this set — there is some peace of mind with them using a nylon knife, but it has a different “feel” to it. By the way, in holding the knife myself, I oddly found it to be nicely “balanced,” not something I was expecting in a knife like this. The cupcake and decorating set retails for $24.99 on the Curious Chef site, but I also noticed that it retails for less (and is also currently on sale tor additional savings) on Amazon.com (note this link includes my Amazon Associates code. The nylon knife set retails for $8.99 on the Curious Chef (more on the Amazon site, so price shop for any of the tools in this line.) The Curious Chef has many products, including child-sized oven mitts and aprons, food prep tools such as vegetable peelers, and much more. They are all cute and I think any child would feel proud to own any of them. Whatever tools you use, try to find some time to get your kids in the kitchen with you. You’ll build some wonderful memories together and sneak in some educational benefits as well! Disclosure: The Curious Chef provided me with the 16-piece cupcake and decorating set and 3-piece nylon knife set for the purpose of review. All opinions are my own (or JavaGirl’s) and were not influenced by receiving the complimentary items. This post contains links that allow you to purchase the items if you are interested in them, including links to Amazon.com, of which I am an Associate. If you purchase these or other items from Amazon.com through the provided link, I may receive a tiny percentage from Amazon, which will help support this site. 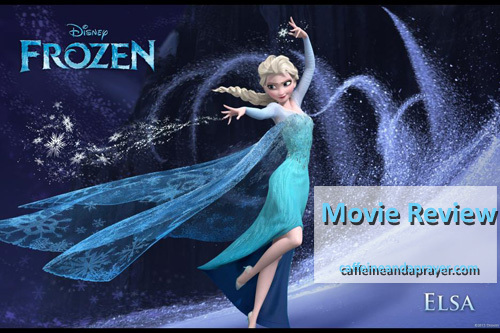 If your Thanksgiving plans include taking the family to see a movie, Walt Disney Animation Studios’ Frozen (PG), should be one of your choices on your list. My family was invited to a complimentary early screening and found it to be delightful. Loosely based on the Hans Christian Anderson, The Snow Queen, it tells the tale of the two princesses of Arendelle, Elsa (voice of Idina Menzel) and Anna (voice of Kristen Bell). Elsa is endowed with magical powers that allow her to create snow and ice with the flick of a wrist, which can be quite fun when you are a little girl. Her unendowed little sister, unfortunately, is accidentally struck by this magic and injured, thus causing Elsa to withdraw and become a recluse so as not to risk injuring her sister or anyone else again. As part of the cure, Anna does not remember the incident and doesn’t understand why her sister is avoiding her. Flash forward several years to when the sisters come of age, and there is a big ball. No one is aware of Elsa’s big secret — until she becomes upset and accidentally sets off winter in her town of Arendelle. The townspeople fear her, proclaim her a witch and she runs off. Anna, who though clumsy and naive at times is no insipid princess, bravely takes after her sister despite the frigid conditions. Along the way she encounters a rugged ice harvester named Kristoff (voice of Jonathan Groff) with his faithful reindeer Sven, and a magical snowman (created by Elsa when they were children) named Olaf (voice of Josh Gad) as well as a variety of other characters I won’t mention for fear of spoiling some vital plot points. What would a Disney movie review be without discussing the merits of the princesses themselves? Elsa, burdened with her magic, never gets to fall into the mold of falling in love with a prince. She leads a lonely life. But she has a wonderfully cathartic song, “Let It Go” that will surely become a top song this year. Anna, makes many mistakes, but also shows remarkable self-reliance for a young woman who has been sheltered all her life. Ultimately she is a princess who does the rescuing, not the other way around. To be honest, I’m not a “musicals” kind of person, so I’m not the right person to evaluate the songs and music in the movie. There were quite a few songs in this movie. “Let It Go” was really the only one that captured me, but with music from Tony® winner Robert Lopez (“The Book of Mormon,” “Avenue Q”) and Kristen Anderson-Lopez (“In Transit”), there are surely other songs that will end up being popular on the radio or iTunes. What I do know is 3D. 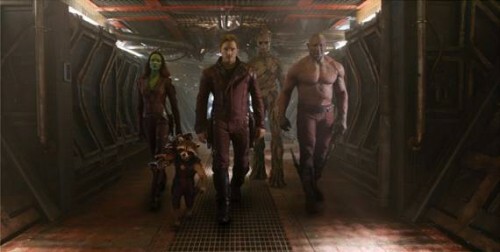 The animation, which we saw in 3D, is beautiful and I highly recommend watching it in the 3D version. The snow and individual snow flakes are stunning. The sheen of the ice is impressive. Additionally, there is a Mickey Mouse short before the movie that you will enjoy more if you see it in 3D. There are a few scary scenes (a snow monster, chase scenes, wolves, fighting) and a few mildly coarse jokes (a lot of references to butts), but overall, I was comfortable with my 7- and 9-year-old kids being there and I’m fairly conservative about what my children watch. This trailer will give you a pretty good idea of the kind of stuff you will see. Frozen opens in theaters today. The PR Company for Walt Disney Animation Studios provided my family with four tickets to the advanced screening to the movie, but as always, the opinions expressed in this review are my own.